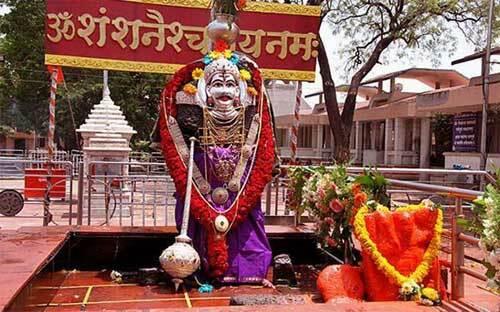 Shani Shingnapur Temple is Maharashtra is one of the popular temples dedicated to Shani Bhagavan. Shravan or Sawan month is considered highly auspicious for offering prayers to Shani. Special prayers are held on Saturdays in Shravan month at Shani Shingnapur. Another auspicious day is Amavasya or No moon day. Shravan month in 2019 in Maharashtra is from August 1 to August 30. Those suffering from bad positioning of Shani in horoscope offer special prayers during Saturdays and Amavasya in the month at the temple. Special abhishekam is also performed on all Saturdays and Amavasya day. Shani Shingnapur is around 35 km from Ahmednagar city and around 160 km form Pune.